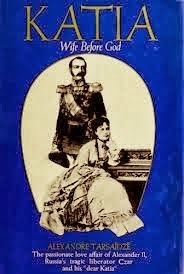 Katia: Wife Before God is a 1970 book, written by Alexander Tarsaidze, on Alexander II of Russia's love affair with Catherine "Katia" Dolgoruky. I give this book 2.5/5. While the book is fairly interesting, it leaves a little to be desired. Although I greatly enjoyed reading the letters exchanged between the two lovers, it felt as though the latter half of the book was carried entirely by letters of the past without any form of analysis. If the reader only wanted to read their letters, why would you need to write an entire book. While the little footnotes at the bottom of the page sure are interesting to read, it does get incredibly distracting and takes away from the main story (Often times, the footnotes would take up 3/4 of the page). What I really would have liked was to have read more about how Alexander's family felt about his relationship with Katya or more on Maria Alexandrovna's perspective of the whole romance. In the end, I feel like I would learn more about Sasha and Katya from their respective wikipedia pages than reading this book.